FREE FROM: GLUTEN, GRAINS. SPECIFIC CARBOHYDRATE DIET (SCD). I’d be lying if I said I never missed potatoes. Sometimes, you just really need potatoes. 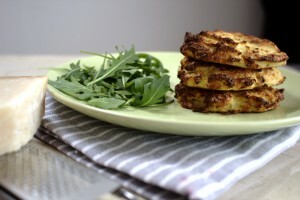 I am always trying to come up with new cauliflower recipes as potatoes are not allowed on SCD. I’m always thinking how I can recreate my favourite dishes of old and make them healthier. I’m not necessarily saying potatoes are not a healthy food, but they are not for me as I cannot digest grains. I absolutely love the texture of cauliflower. It is so versatile and it’s almost starch-like quality can mimic mashed potatoes or rice depending on how you prepare it. 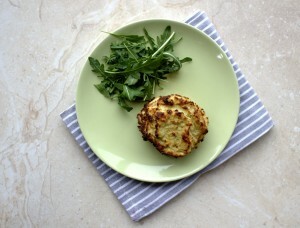 These cauliflower fritters are my answer to my classic potatoes cakes of old. And my, do they taste good. Cauliflower fritters are surprisingly easy to prepare and they go great with just about anything. I enjoy them regularly with soup, smoked salmon, salads or even with roast chicken. Packed with vitamin C, cauliflower is great for this time of year when all of our immune systems’ need a little boost. In my pre-SCD days I never ate cauliflower. Apparently people with Crohn’s cannot digest it. Well, at the moment I have cauliflower at least three times a week in some form or another and I tolerate it very well. Of course, everyone is different and what suits one does not suit another but I am so glad that me and cauliflower have finally reconciled. I baked these fritters not fried because well who needs to fry in oil if we don’t have to? They don’t take long to prepare so you can whip them up quickly before your friends come around to lunch. You can easily double this recipe if you want to freeze a batch for later also. 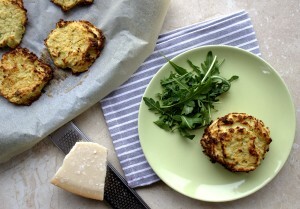 Gluten and grain-free cauliflower fritters : great as a side or main dish. Also suitable for the Specific Carbohydrate Diet (SCD). Cook the cauliflower in boiling water for 10 minutes. Drain in a colander once ready and pat dry with some kitchen paper to remove the moisture. In a blender add the cauliflower, two cheeses, almond flour, spring onion, parsley, eggs and season well with salt and pepper. Mix well. Place even scoops of the mixture onto prepared baking trays lined with parchment paper. Bake for 25 minutes.